National Southern Folklore Festival in Pico Truncado - Pico Truncado, Patagonia, Argentina. 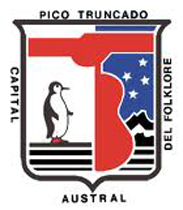 The National Southern Folklore Festival is held every year in Pico Truncado, Santa Cruz. This festival takes place in order to disseminate the national and popular folklore. During the festival, delegations from around the country compete for the coveted "Golden Penguin", the top award given to those who secure first place in the contest. Participants are divided into categories such as solo vocal, couple of traditional dance, combined northern Malambo, reciter, engraving, gruop of traditional dance, etc, and are reviewed by members of the Secretary of Culture of the Nation. It also has a cultural hall, a craft show and a business lounge in which those attending the festival can engage in recreational activities. The little ones also have jurisdiction under the festivalito. The festival began as a folk rock in 1968 in which only local people participated. Then grew, calling on participants from throughout the region until it was declared of national interest and become the National Southern Folklore Festival. This takes place every year between October and November. Wind Farm in Pico Truncado The Wind Farm "Jorge Romanutti" is in the southwest of the town of Pico Truncado and it was reopened on March 5, 2001 after having been out of operation because of one of the turbines had failed. Bridasaurio, Carlos Regazzoni in the Patagonia The Bridasaurio is a sculpture of 17 meters long and 4 high built by Argentinean sculptor Carlos Regazzoni in Pico Truncado. A Sonora Town in the Patagonia At 5 km from the town of Pico Truncado it is "Sonora Town", a park with sculptures built to sound over the wind. Lagoon De los Patos, Pico Truncado Just 2 kilometers from Pico Truncado it is the Lagoon De los Patos, an ideal place for bird watching.